Little by little, Surrey Central is getting more restaurants and cafes. 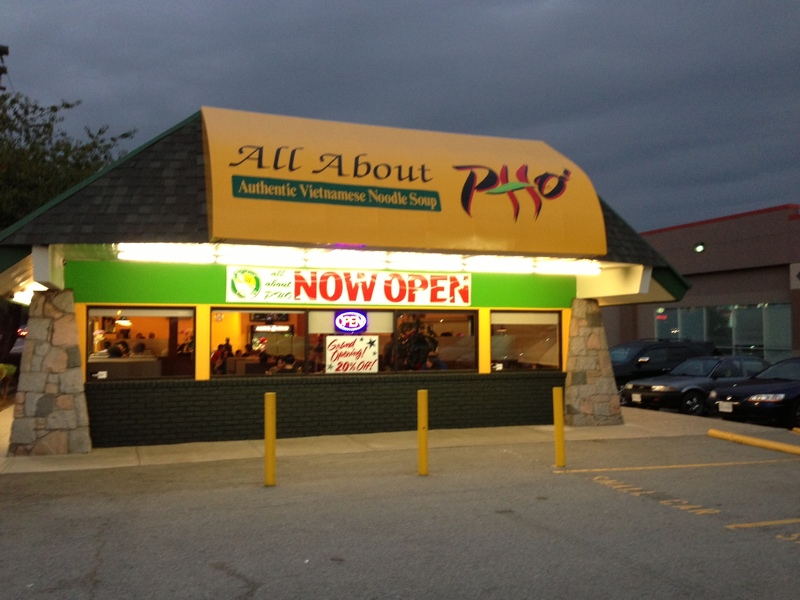 A new Vietnamese restaurant called All About Pho has opened up on the space where the old 7-11 space used to be on King George Blvd. I was a little puzzled by the amount of negative reviews on Urbanspoon for this place. It’s only been opened for about two weeks, maybe three. I admit that I almost didn’t go because of the amount of negative reviews, but my friend wanted to go, so we did. In the end, I’m glad I did, as I had a chance to make an opinion for myself. The place was very busy, and it was very clean. Our service was very friendly. On Urbanspoon there were complaints about the restaurant being dirty, the food bland and the service rude. I personally didn’t experience any of those things. 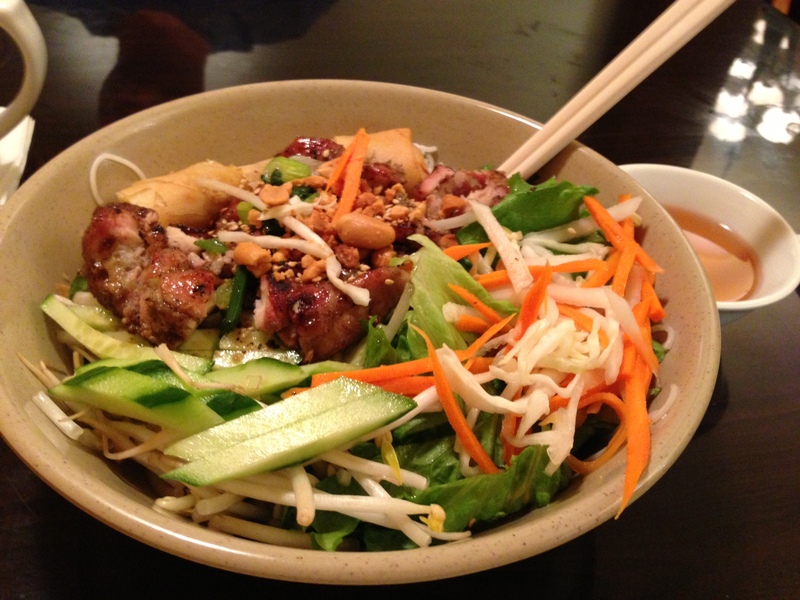 The menu has a wide variety of Vietnamese favourites and a lot of variety. Noodles, subs, bubble tea etc. I enjoyed my favourite: the Bun Ga Nuong Cha Gio – a vermicelli bowl with grilled chicken, a fried roll, and lots of delicious veggies. It was very good. I also ordered a salty lemonade, it sounded interesting so I decided to give it a try. Turns out the lemons were a tad old and it wasn’t to my liking. Our server exchanged it for a fresh lemon soda – think of a lemonade with shaved ice and seltzer. Delicious. 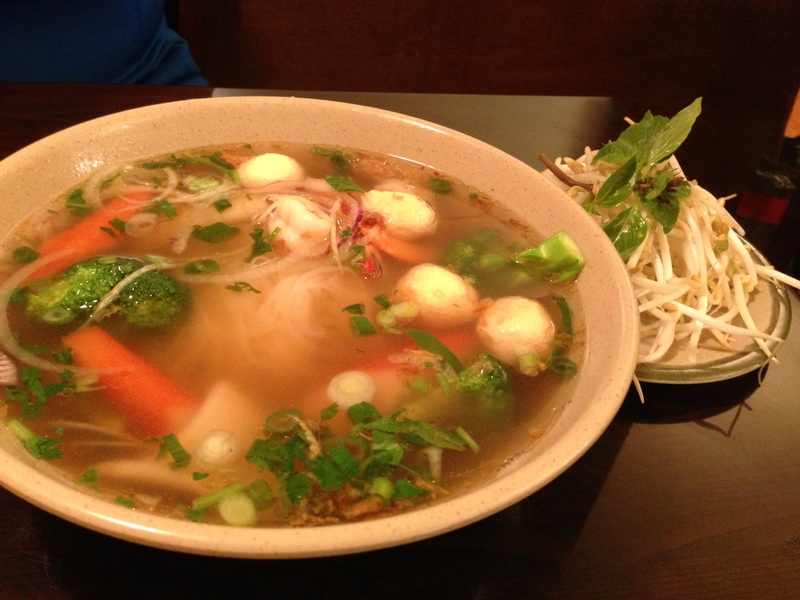 Overall, I had a positive experience at All About Pho.